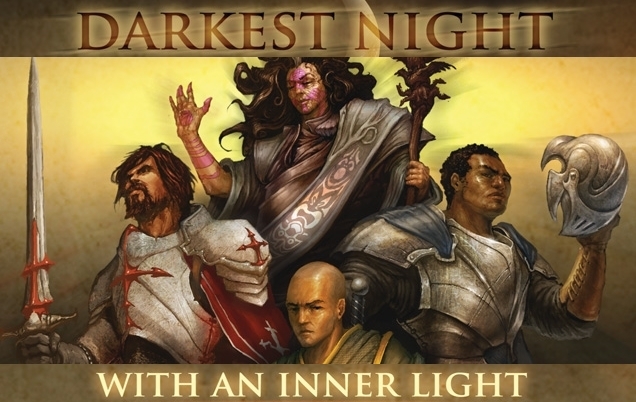 Today on Two Minds About…, Dan Thurot and Brock Poulsen are absolutely going to disagree about the sublime cooperative and solo game Darkest Night. Total disagreement. Friendship-shaking disagreement. Dan: Wow, that sounds rough. Been good knowing you, Brock. Brock: Our friendship had a good run, but this is the one! This game will sunder our fraternal bond forever. When you’re a force for righteousness like myself, there’s nothing quite so satisfying as driving a holy relic through the eye socket of a foul necromancer. Ah! The splash of his brain-ichor, cold and rancid, soaking the cuff of my tunic! There are very few games that provide necromancer-slaying goodness quite so well as Darkest Night, one of my favorite solo and co-op games from last year. Its first expansion, With an Inner Light, which added the incentive of quests to get you roaming the map more and just hanging out in the mountains and forest less, was too. So the question: are the two newest expansions for Darkest Night, On Shifting Winds and From the Abyss, as good as we’ve come to expect from Victory Point Games? For this month’s issue of Alone Time, I covered a stellar little game called Darkest Night from Victory Point Games, the “Little Game Company That Could” (no really, that’s their actual self-designated nickname) (no, really, would I lie to you about that?). Well, as much as I loved Darkest Night, now I have to retract some of my praise — because however good it is, I’m never going to play it again… unless I’m also using With an Inner Light, which takes a fabulous game and makes it even fabulous-er. How does With an Inner Light manage such a makeover? Good question! Let’s find out together. Remember that scene in the second The Lord of the Rings movie where Frodo, Sam, and Gollum ran out from under their marsh-bush to shoot arrows at the passing Nazgûl and its fell steed so they could do battle? Yeah, me neither. Because instead, they cowered under that bush and shat their britches and hoped they wouldn’t have to do any fighting at all. Most fantasy games don’t operate that way. Instead of sneaking about, their heroes barrel in with nocked arrows and raised swords, even though any halfway decent dark lord would seize the opportunity to fit them for some shallow graves. Not so in Darkest Night from Victory Point Games. The theme of this one-to-four-player co-op is familiar in one sense — a necromancer is polluting the kingdom, etc., etc. — but this time, your valiant heroes are going to be creeping around on their bellies and praying they don’t attract too much attention, because if they do, the necromancer is going to mosey over and put some serious hurt on their noble bottoms.